Our 10ft polytunnel is ideal for any allotment and can be used for propagation early in the season and growing full-scale throughout the rest of the season. Why not grow some winter salad as well. You might call it a polytunnel for all seasons. 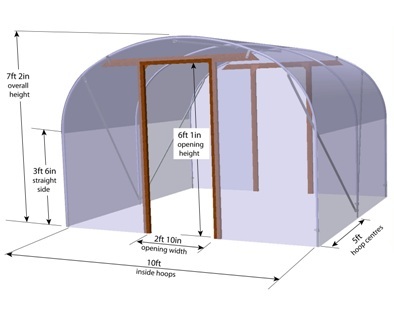 It's no surprise then that this is our most popular width of polytunnel. The cost of the 10ft wide range is only marginally more than our 8ft wide model - Real value for money! See below for a more detailed specification. No Anti Hot Spot Tape thanks. Foundation Tubes: Thick-walled, heavy galvanised with cover tensioning system. Hoops and Ridge Tube: Z35 galvanised steel tube, diameter 25.4mm with a thicker wall of 1.5mm. Polythene: 5 year guarantee with 7-8 years life expectancy. 800g Clear for the most natural light conditions, better for ripening crops. 800g Diffused scatters light for benefit of whole crop, better for sunnier locations. End Frames: Tanalith treated timber, 1½" x 3½" (actual size), planed with rounded corners for easier handling and smooth appearance. Double-row of ¾" x 1½" Tanalith treated battens to secure the polythene cover. Brackets: Galvansised for improved resistance to corrosion. Purpose-designed so each type of bracket is perfect for its intended use. Corner Braces: Z35 galvanised steel tube, diameter 25.4 x 1.5mm. Best design to ensure they don't encroach into the usable space whilst still supporting the end hoop at the optimum position. Bolts, Screws & Nails: Galvansised or zinc plated for corrosion resistance. Coach bolts are used for timber connections. Steel-to-steel connections use Nylock nuts which can't vibrate loose.